With the upcoming ‘Super Saturday’ By-Elections on the immediate horizon, we only thought it prudent to release some how-to-vote guides for our interested members. 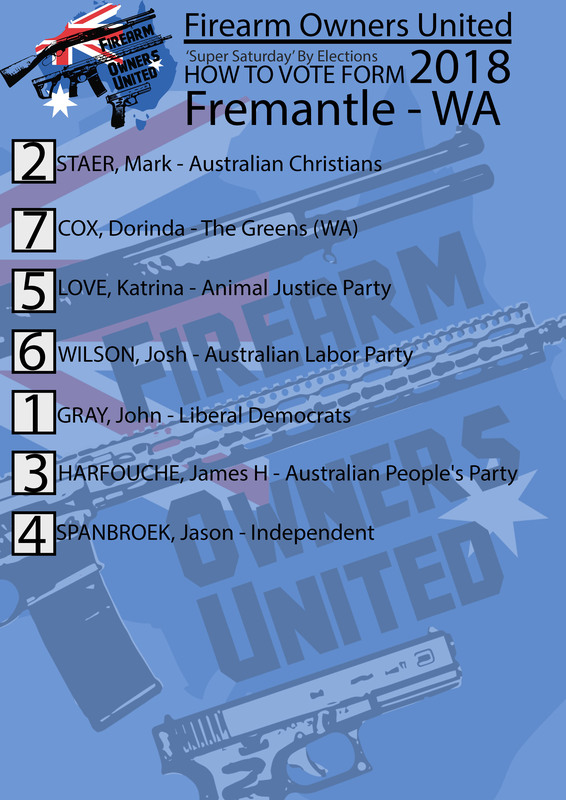 We have released guides for the seats of Fremantle, Braddon, Longman and Mayo, just click the link to view the guide for each seat. 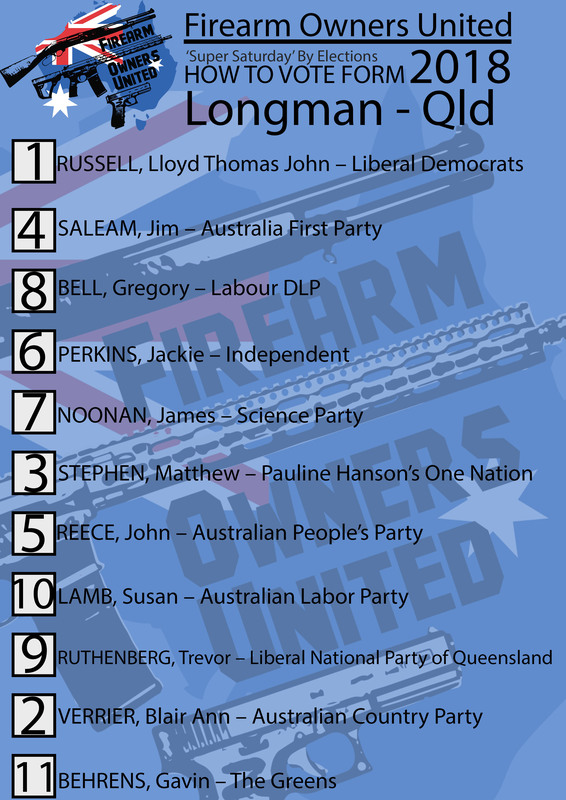 The seat of Longman in particular has come to some attention as being the most potentially influential by-election of the lot, keeping this in mind we reached out to all the candidates in the seat with a series of question to directly assess their firearm’s policy. Not all bothered to respond, but their contempt for LAFOs is fairly well know so this was hardly a surprise. The questions we sent where as follows. – Is the candidate a member of the shooting/hunting community? – Has the candidate had any experiences with firearms or hunting? -Focusing on Federal matters, what is the candidate ’s thoughts on recent moves to permit the importation of electroshock aka Tasers and pepper spray devices for the use in the general community as tools of self defense. -Would the candidate support a move to amend the customs regulations to rationalise the importation of repeating shotguns other then pump, lever or bolt into item 2 from item 12, inline with the restrictions on repeating rifles. 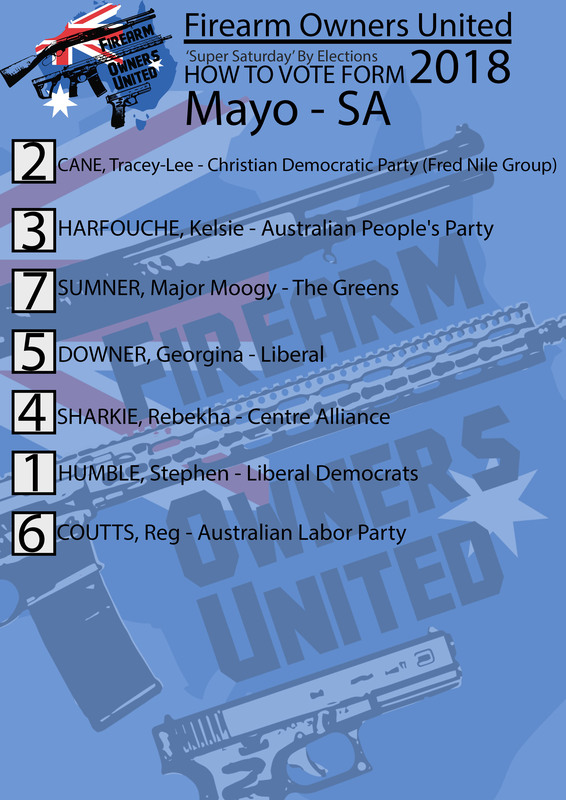 – Does the candidate have a defined plan on how to approach illicit firearms in our community? If so, would your approach further restrict the licenced Firearms community? – When planning for our community, does the candidate develop their approach on the facts and evidence available? Does emotion have any significant impact on this process? – Does the candidate support the removal of policy that has no evidence to support it’s implementation? – Are there any additional comments you would like to make? No email was listed for the Liberal Democrat’s Lloyd Russel so instead we gave them the courtesy of a phone call and Lloyd was only too happy to answer our questions on the spot. – Is Lloyd Russel a member of the shooting/hunting community? No at present due to eyesight problems. – Has Lloyd Russel had any experiences with firearms or hunting? I was brought up on the land, and can’t even remember how young I was when I learned to shoot. -Focusing on Federal matters, what is Lloyd Russel’s thoughts on recent moves to permit the importation of electroshock aka Tasers and pepper spray devices for the use in the general community as tools of self defense. The LDP policy and mine as well, is that people should be allowed to have these devices and to be allowed for their own self protection. -Would Lloyd Russel support a move to amend the customs regulations to rationalise the importation of repeating shotguns other then pump, lever or bolt into item 2 from item 12, inline with the restrictions on repeating rifles. Yes, the importation requirements should be the same for shotguns as for rifles. – Does Lloyd Russel have a defined plan on how to approach illicit firearms in our community? If so, would your approach further restrict the licenced Firearms community? What the LDP would like to see is the decriminalisation of cannabis and other types of drugs, to allow law enforcement to focus on illicit firearms. We are more than comfortable with licensing and categorisation of firearms, but would not seek to further restrict the community. – When planning for our community, does Lloyd Russel develop their approach on the facts and evidence available? Does emotion have any significant impact on this process? We base our policy on facts, not just those from Australia but worldwide. As well as our libertarian values. – Does Lloyd Russel support the removal of policy that has no evidence to support it’s implementation? If it isn’t evidence based, and I think a classic example a is the Adler shotgun, with the magazine capacity restriction from 7 shots to 5 shots. Whether the shotgun has 10 or 5 is an irrelevancy. Lloyd suggested we check out their firearm’s policy which you can view here. Robert Danieli the Chairman of the party responded on Blair’s behalf. – Blair is not a shooter but she does approve of shooting, hunting and all other legitimate recreational pursuits that our Party supports. – Blair grew up on a farm so is quite familiar with the use of firearms. Her personal interests are now more towards horses. – Regarding Tasers and sprays for self-defence, we have concerns that these items will most likely be adopted by criminals for use against their victims if they are made available to the general public. I thought this was just a silly Greens idea following their recent ideology that all men are rapists. Community safety is better addressed by our policy that there is to be a zero tolerance for violent crime. Our policy will also allow people the right to defend themselves in their own home, and on their own property, with whatever means necessary, provided they can then justify the response taken. This aims to take rights away from perpetrators and give it back to the victims of crime. – We are against any further restrictions on legitimate firearm owners. We actively work with shooting organisations regarding any reclassifications. I for one would love to have my auto shotguns back but this may take time. – Our firearms policy touches on the criminal use of firearms. We want to see very harsh penalties introduced for the criminal use of firearms or the possession of illegal firearms. We are against any further regulation of legitimate licensed firearm owners. – We are a Party that operates on common-sense not on kneejerk reactions or emotion. Be prepared for Blair to listen, think, question, then act. – There are a lot of policies that do not reflect the interests of our people or our Country. Policies should never be written in stone so we will always be open to make changes where changes are needed. I’ll try and get more detail from Matt on some of those questions when he gets some time. Q1. Is James Noonan a member of the shooting/hunting community? Q2. Has James Noonan had any experiences with firearms or hunting? Q3. Focusing on Federal matters, what is James Noonan’s thoughts on recent moves to permit the importation of electroshock aka Tasers and pepper spray devices for the use in the general community as tools of self defense. A3. We don’t have any intentions to change current policy. Q4. Would James Noonan support a move to amend the customs regulations to rationalise the importation of repeating shotguns other then pump, lever or bolt into item 2 from item 12, inline with the restrictions on repeating rifles. A4. We have no intention of changing the current legislation towards easier access to firearms. Q5. Does James Noonan have a defined plan on how to approach illicit firearms in our community? If so, would your approach further restrict the licenced Firearms community? A5. We support current gun legislation. Q6. When planning for our community, does James Noonan develop their approach on the facts and evidence available? Does emotion have any significant impact on this process? A6. The Science Party uses an evidence based approach to all our policies. Q7. Does James Noonan support the removal of policy that has no evidence to support it’s implementation? A7. It depends on whether there is evidence to suggest the alternative. Regardless, further evaluation is required. If you’re anything like me, you keep hoping for relatively pro-gun candidates to win enough seats to bring in major changes for the better and you keep getting disappointed. 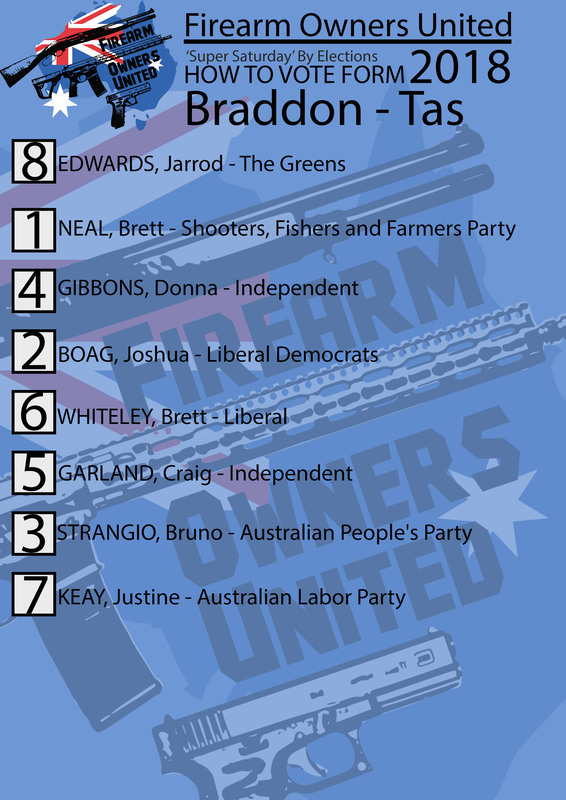 The National Party wants to introduce a national firearms registry, just like Liberal, Labor and The Greens, even though firearms aren’t a Commonwealth concern. Commonwealth matters are listed in Sn51 of the Constitution Act 1900 ( https://www.aph.gov.au/About_Parliament/Senate/Powers_practice_n_procedures/~/link.aspx?_id=AFF6CA564BC3465AA325E73053DED4AA&_z=z#chapter-01_part-05_51). The only one of the major parties even a cynic might hope to be a little bit pro-gun, supports an unconstitutional national gun registry. Ay, carumba!